Each minute in the UK around 500 used coffee cups are thrown away, totalling waste of 2.5 billion cups each year. Even when these cups are recycled the UK has very few facilities that can split the paper and plastic components which line the cardboard cups. This results in less than 1 in 400 coffee cups actually being recycled. Noah’s Ark Zoo Farm currently holds Gold in the Green Tourism business scheme and has recently won the Gold award for it’s Sustainable efforts in the Bristol, Bath and Somerset Tourism awards. We are now going even further in our green initiatives by taking steps to make sure none of our food packaging goes to landfill. Noah’s Ark’s will now be using products from the sustainable Eden Ware range. The takeaway food containers are made from Bagasse (recycled sugarcane fibre), an eco alternative to polystyrene with 99% less carbon. The completely compostable coffee cups are made from sustainably sourced board and lined with plant-based Polylactic Acid (PLA). PLA is derived from renewable resources like cornstarch or sugar cane and it is therefore biodegradable. 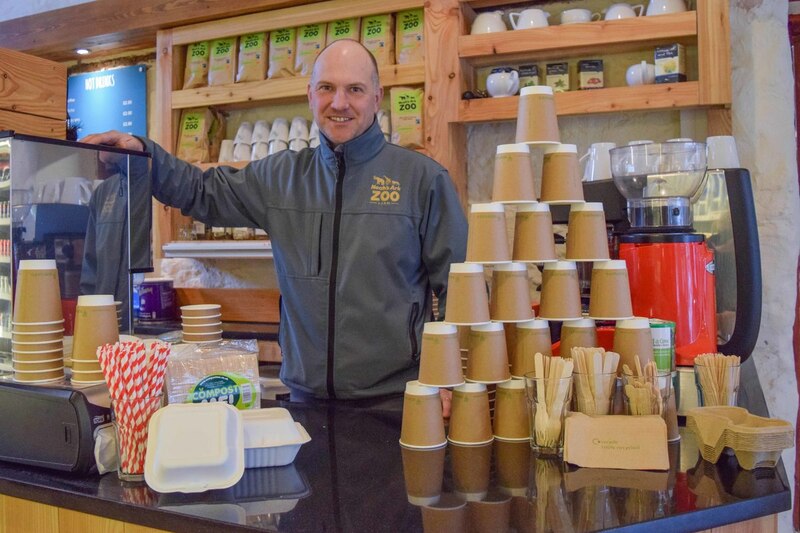 The cups have a low carbon footprint thanks to starting life as carbon-absorbing plants and any ink printed on the cups is made from soya based ink. Even the lids are made from corn stalks, allowing the whole cup to be composted. Single-use plastic straws are particularly bad for the environment, used once for about 20 minutes and then discarded to landfill. Plastic straws take hundreds of years to break down and are ending up in the ocean by their thousand. Not only that, but plastic straws often contain BPA a chemical that can seep into food or beverages and is associated with health risks including breast cancer, early puberty and infertility. Noah’s Ark is making the move away from plastic straws and introducing a paper-based straw that is fully compostable. Although the materials of these new products are compostable, they must be disposed of in a special way to aid the composting process. Noah’s Ark will ensure these waste products are disposed of via commercial composting facilities with ideal composting conditions. This allows the waste to fully biodegrade in only 120 days!